Before I begin, I must give thanks to the Stamford Advocate and reporter Elizabeth Kim for the front page story on cycling activism in Stamford. Please head to your newsstand while there is still time and buy a copy. Additionally, I must thank photographer Lindsay Perry (who I met last year during the Cycling with Candidates project) even though she, along with the paper's editors, ignored my warning of a decline in circulation and included a photograph of me in the story. In spite of that, if you do not subscribe to the Stamford Advocate, buy today's paper. Well worth the $1. Now: let's move on to tomorrow: the Mill River Bike Ride & Rally. 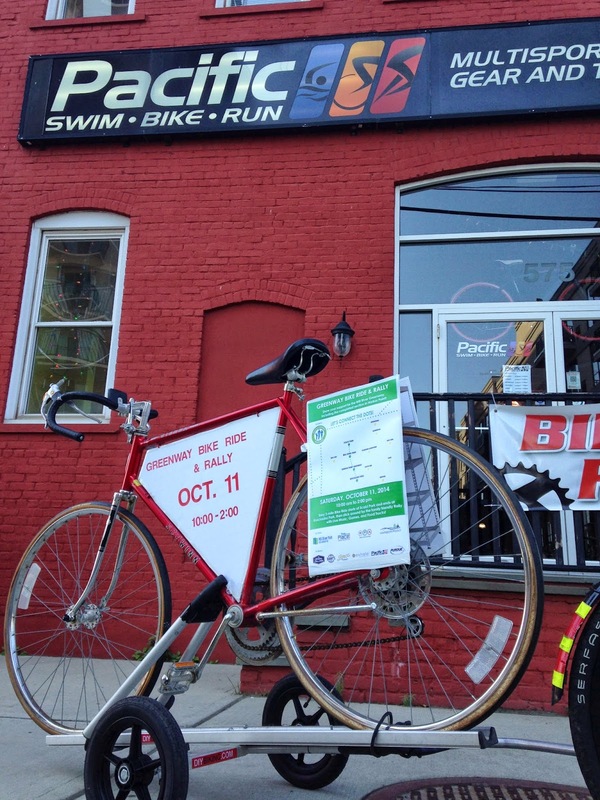 Pacific Swim Bike Run, located at 575 Pacific Street, is among the great businesses in Stamford that are sponsoring this event and will be found at Kosciuszko Park tomorrow. After looking at the weather forecast for Stamford - and thinking about the wet but ultimately successful Bike to Work Day 2014 - I decided I might move to California and plan a variety of bike-related events all over the state in order to end the drought. Even though the weather in Connecticut is officially 'iffy' on yet another outdoor bike event I am involved with, the three-mile ride from Scalzi Park to Kosciuszko Park is still, as of this moment, on. But if you can't ride safely in rain or wet weather safely just head to Kosciuszko Park (200 Elmcroft Road) and pick up the event by 11:00 at the pavilion. And it goes without saying: if you have a bike and can ride it safely, bring a helmet and wear it properly. Let's hope the weather gods smile upon us all tomorrow - and stretch a hotel shower cap over your helmet if you must. I'll be bringing a few just in case. Hope you come to the event to support the Mill River Greenway and a more bike friendly Stamford. Thanks for reading and thanks for riding.